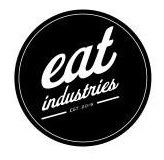 Vendor Profile – Eat Industries Inc.
As many of you know, Green Venture’s 20th Anniversary Celebration UpRoot Hamilton is rapidly approaching – this Saturday Oct 3rd at EcoHouse. UpRoot Hamilton is a platform to showcase local food and drink in a beautiful heritage setting while celebrating 20 years of community outreach, education and making the Hamilton region a more environmentally-friendly place to work, live and play. When Fundraising and Events Coordinator Ashley Keenan came across Eat Industries Inc at the 2015 Hamilton Beer Festival she knew that they had to be a part of this vision. Earlier this year business partners Brandon Jackson and Matt Pigeon moved away fr om the Toronto food scene to start a business here in Hamilton based on local, fresh, seasonal and handcrafted items. “I love the Hamilton area” says co-owner Brandon Jackson, “The community here is embracing new things and really care about local start-ups.” Aside from their farm-to-table approach to business, Brandon also keeps ‘green’ at home with his family by biking and harvesting meals from his garden. Eat Industries showcases local foods, butcher their own meat and take care to make all their items themselves or alternatively use products from other fresh and sustainable Hamilton establishments. It is truly amazing to see a vendor starting a food establishment, and hopefully soon to be a food chain, which is customer driven and environmentally responsible; showing us that ‘fast food’ doesn’t have to be cheap or sacrifice flavour. ent location in the Hamilton Farmer’s Market. Be sure to try their tasty creations at UpRoot Hamilton this Saturday! Get your tickets here. 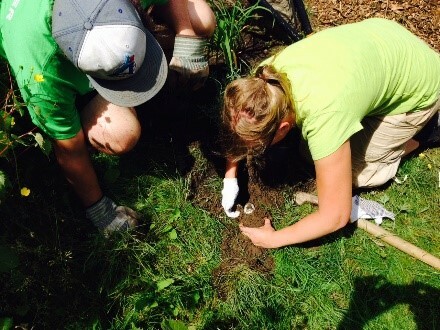 On June 20th Green Venture set out to Veevers Park with a mission of ‘planting and beautification’. Several times a year, with the help of staff and volunteers, we head to our adopted park to do some tidying. These projects can include litter collection, planting, weeding, graffiti removal, painting, and anything else that the area might need. 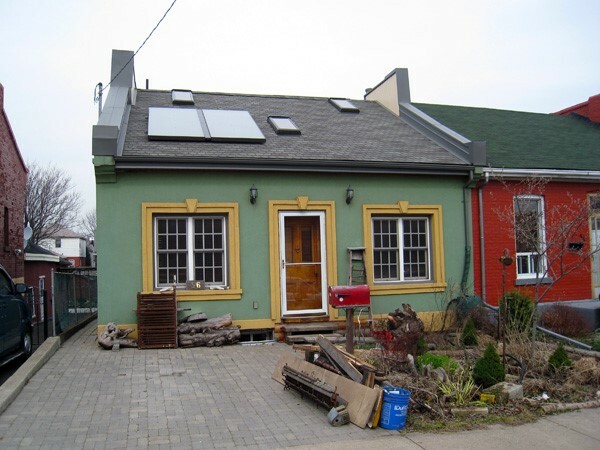 We adopted Veevers Park in 2013 to connect and contribute to the local area and community surrounding our office, Ecohouse. Our clean-up this past weekend was very productive! We gathered 4 large yard waste bins full of weeds; mostly notably was the thistle growth around the play area. There was a large patch of these prickly little weeds right on the children’s playground restricting where they could run and play. Volunteers and staff put on their extra thick gloves and made the area safe and spacious to play in again for little ones. 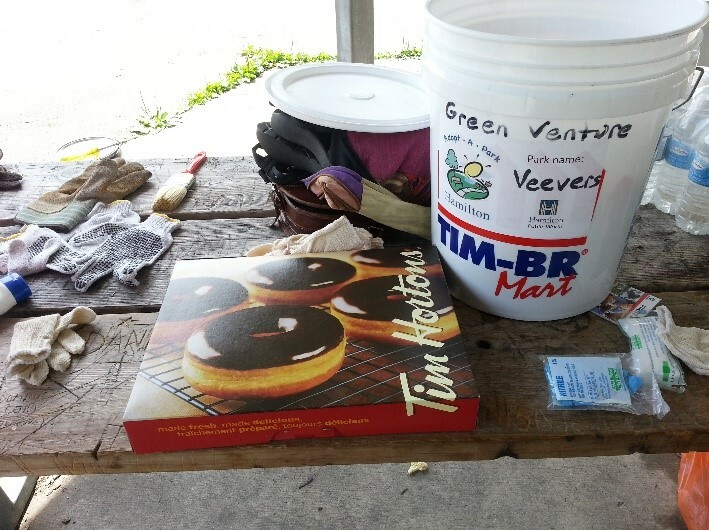 A big thank you goes out to all the patrons of Veevers Park! We collected half a bag of trash from the entire park. Keeping our parks clean and enjoyable is a community effort and it is obvious that you all are doing your part to do so! Keep up the great work. During our time cleaning and planting on Saturday many families came by to utilize the park but one woman and her two small children get our special thanks. They left the park, seemingly just done playing for the morning, but came back shortly after with donuts for our team. It was such a kind and appreciated gesture that gave us the extra energy we needed to get the job done. Last, but certainly not least, we want to thank the volunteers who came out. You worked very hard on a hot, sunny, Saturday morning with cheerful smiles and tons of energy! We could not have done it without you! 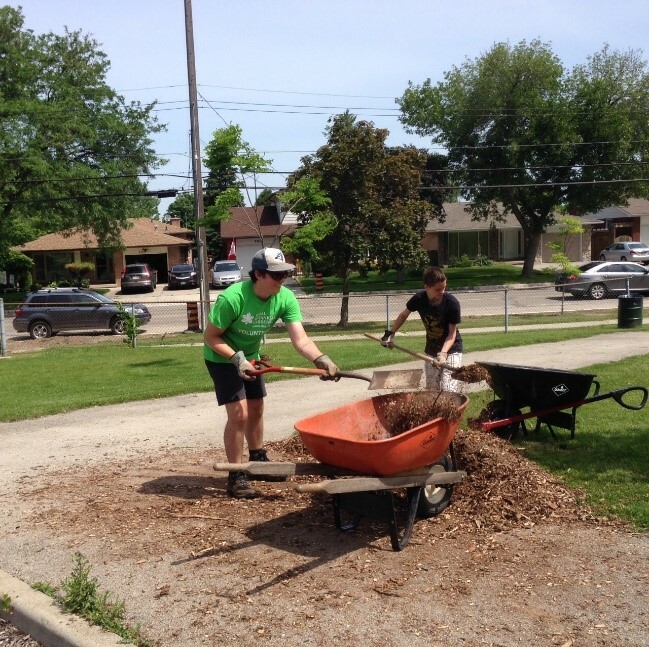 The adopt-a-park program is run through the City of Hamilton to bring communities together through parks – “Great parks make great neighbourhoods!” A group signs on for a 3 year timeframe and organizes park enhancements as well as clean-ups. To learn more about this program and how you can make a difference in your area check out this link. Leave us a comment on your favourite park to visit in Hamilton or how Green Venture can continue to improve Veevers Park in future clean-ups! The 3 R’s – Reduce, Reuse, Recycle. A familiar phrase and usually exhibited by any environmentally friendly program or event. We often talk about recycling more and consuming less, but today we wanted to focus on reusing. In Hamilton, the City operates drop off centres where you can donate furniture, appliances, and bulk items like toys. There are three locations in Hamilton where you can drop off stuff to be reused. The location at 37 Kilbride Road even has a store where you can purchase re-usable items. Reusing just makes sense! We have already made the product, we might as well reuse it. Disposable products have become attractive because they are convenient and we usually don’t directly pay to throw away our waste. The cost of disposal isn’t included in the ticket price and paid through our taxes so it often isn’t factored into the purchase leaving us with tons of disposable items filling our landfills. 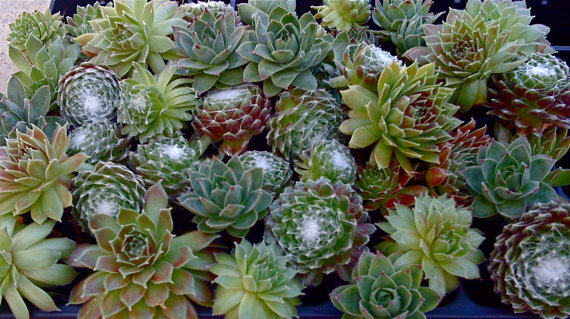 Reusing can also come in many forms, you may be reusing and not even know it! Like using a refillable water bottle, instead of a disposable plastic water bottle. Our using reusable coffee cups, tupperware instead of plastic bags and reusable grocery or tote bags. You’re increasing the lifetime of the product and reducing the need for another! Within Hamilton, there are lots of companies centred on reusing like Habitat for Humanity’s restore. The Restore takes donations in home renovation materials, such as doors, toilets, lights, and furniture and sell them at significantly lower prices than you would pay for a brand new version. One company you may not know about in Hamilton which is centered on reusing is REfficient. REfficient is a leader in asset recovery and reverse logistics for the reuse and resale in telecommunications and cable. What does that mean? REfficient helps telecommunications companies buy or sell inventory or equipment. Large companies may be looking to manage their extensive networks and small companies may be looking to expand. REfficient helps these companies connect and solve these problems. Not only that but as a customer of REfficient you can also request statistics on waste diversion rates and the carbon footprint of your transaction. 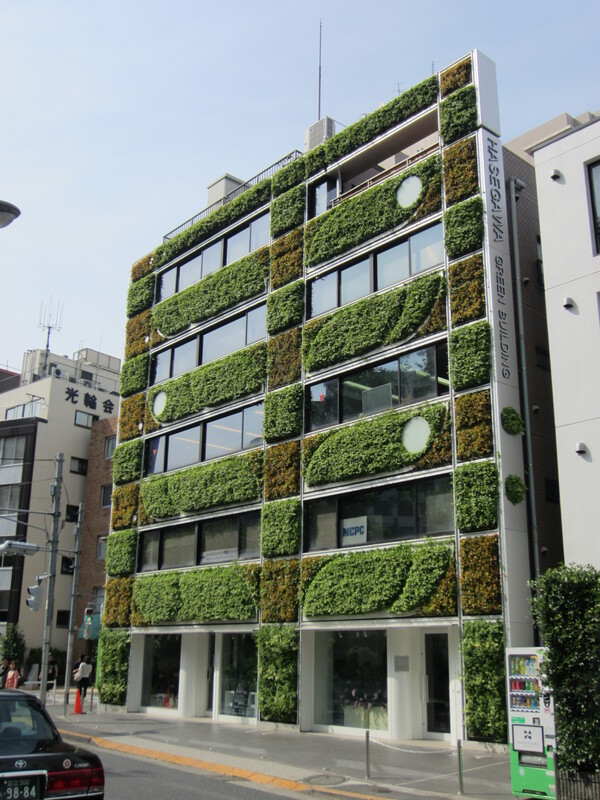 This means that companies that want to become environmental friendly can instantly know their impact and use that information to make better decisions. Whether you’re an individual bagging your groceries with reusable bags or a large organization looking for a new printer, the bottom line is reusing is an economic venture. There are plenty of things and ways to reuse in Hamilton, why not give it a try?! After a great weekend cleaning up Hamilton’s alleyways with the Beautiful Alleys Clean Up Project, we were feeling a bit inspired to brighten your day! Alleyways are a defining feature of older urban neighbourhoods. Such extensive networks of passageways and open spaces offer easy access to homes and businesses with minimal car interference. Rather than developing alleys for the benefit of the community, they have become forgotten, underused and abused public spaces. Does Your Alleyway Need a Makeover? 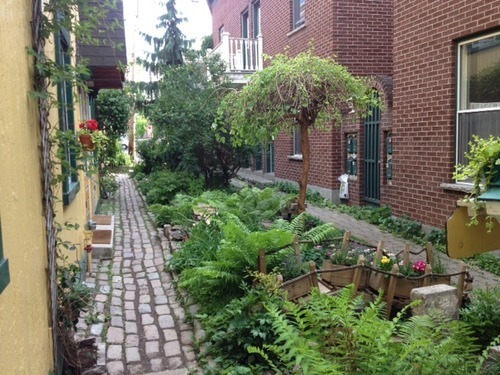 Do you have an alleyway in your neighbourhood that could use a little help? 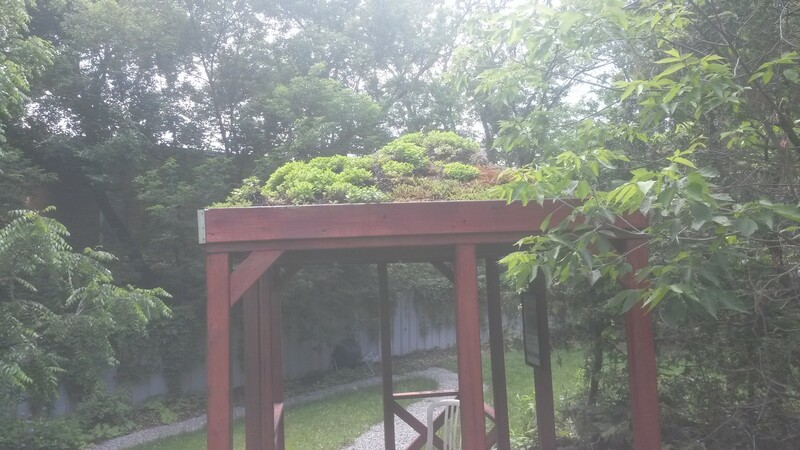 Beautifying community spaces by adding green space and removing unnecessary asphalt and concrete not only renews the space, but has been proven to improve our community’s water quality, build neighbourhoods, increase bicycle and pedestrian connections and increase natural habitats for birds and butterflies. 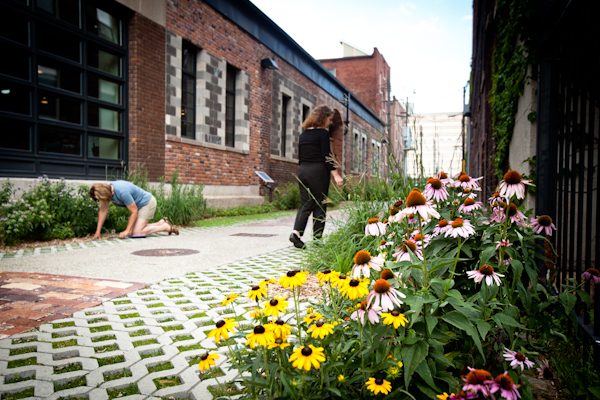 Through our GALA Alleyway Project, Green Venture is working to transform these spaces to include native species gardens, solar lighting, local art, natural playgrounds and games, and so much more. We want to hear from you! 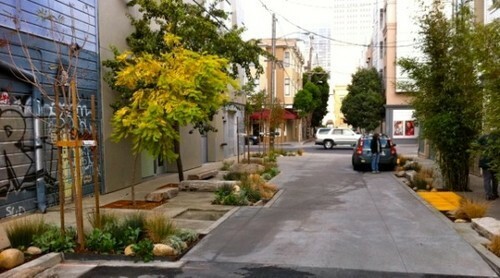 Do you know problem areas and heavily travelled alleyways that could benefit from a little beautification? Let us know here by filling out our short survey. Contact deirdre.connell@greenventure.ca for more info. Need some inspiration? 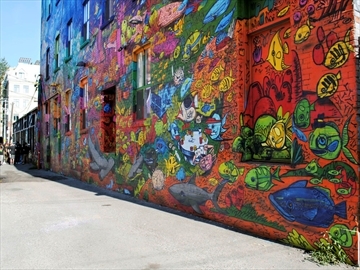 Here are some Laneways we Love!